Is the East Windsor Ambulance a for-profit private business? No, the East Windsor Ambulance is a Non-Profit 501c3 non-stock corporation and functions similarly to the Warehouse Point and Broad Brook Fire Departments, The East Windsor Visiting Nurse Association, the Warehouse Point Library, The East Windsor Scout Hall, Tolland County Mutual Aid Dispatch, and the American Red Cross. Do any of the officers or employees take home profits from the association? No, The Chief of the organization is compensated a set salary for each year. His responsibilities include administration, patient billing, scheduling, procurement of equipment and supplies, and much more. The Paramedics and Emergency Medical Technicians of the association work for an hourly wage for the shifts that they work. All revenues generated are for the operation of the organization. Are the financial records of the organization subject to a professional outside audit? Yes, a complete audit of all financial activity is conducted each year by Accounting and Aditing Services, LLC 115 Elm St. in Enfield CT, 06082 860-745-2500 https://www.laganaandcompanycpa.com, an independent auditing firm. All required nonprofit tax returns and tax payments are completed as required. How much revenue does the Town of East Windsor provide the East Windsor Ambulance? The East Windsor Ambulance Association receives no Town funding. We are not a town agency and are not town employees. While for many years we received a substantial amount of tax revenue to support our services, we have received no town funding since 2012. We are provided a small facility that includes some utilities and some repairs at no cost. 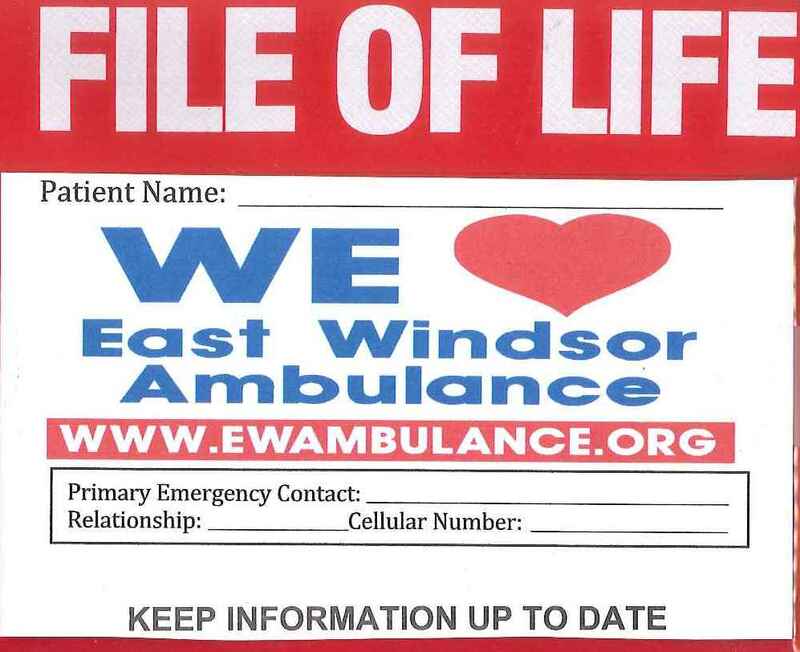 What expenses is the East Windsor Ambulance responsible for? Do other communities the size of East Windsor provide funding to their community ambulance? Most communities do provide some revenue to their EMS systems. However, many have begun to reduce or eliminate it. If you were to study each individual system, there is no predominant EMS structure or formula for levels of service or receiving revenues. Some towns and cities invest heavily in their systems while others, like ours, get it for free. Do all communities provide the same level of care? No, The East Windsor Ambulance Association provides the highest level of Paramedic pre-hospital emergency medical care available in the State of Connecticut. Many towns still have basic life support ambulances staffed only by Emergency Medical Technicians. They utilize paramedics services from other towns or from some commercial ambulance services. Often times, these paramedic services come from great distances. Our service has 2 ambulances staffed each with a paramedic and an EMT 24 hours per day most of the time. This is exceptional coverage for a town with a 10,000 person population. East Windsor has enjoyed this level of service for over 15 years. Is there an ambulance fee for our treatment? Yes. all ambulance services in the State of Connecticut now bill their patients for the medical care they provide. This includes services that have volunteers or paid employees. Most ambulance services in Connecticut charge the same universal user fee. All ambulance service fees are regulated by the State of Connecticut Office of Emergency Medical Services. The fee schedule determines how much we can charge. Can we bill patients that refuse care or transportation to the hospital? We cannot bill for patients that refuse to be transported or refuse to be treated. The one exception is cardiac arrest patients that we are called evaluate or treat or to make the determination that a patient has expired, but we do not transport. We also cannot bill for calls we are canceled for or for fire and police emergency standbys. Do we accept a patients insurance? The East Windsor Ambulance submits all claims to your insurance directly. We do not use an outside vendor. If you provide us with your insurance information, we will submit it. This includes private medical insurance, government programs, worker's compensation, auto claims, etc. Do we accept what an insurance company is willing to pay? Government health programs supersede the State's fee schedule such as Medicare, Medicare Advantage, Tricare, and Medicaid. The governments decide how much they will pay. In these cases, we are required to accept them. For private insurance, in past years, we participated in-network with insurance carriers, which allowed them to individually decide what they paid us. Many ambulance services felt this was unfair and impractical, and have ended this practice, as did we. As a 911 emergency service provider we are not required to participate in-network. We now find that most insurance companies do reimburse at in-network rates, the full billed amount, for emergency ambulance transports. But some still do not. If this is true for your bill, we encourage all patients affected by this to appeal their bill to their insurance company or to the state insurance commissioner. It is our experience that many will reconsider the bill. Unfortunately, there are some insurance companies that, because of certain plan rules, will not. In those cases, we do balance bill for the entire amount regardless of the insurance Explanation of Benefits details. This is a practice that most emergency ambulance systems now follow. Can you pay your bill online? Yes, Please enter your Run Number below and click Pay Now. We accept PayPal, American Express, Discover, MasterCard, and Visa. Do we send accounts to a collection agency? If you have questions, please contact us using the contact information page.